Safety for Life is a critical value that’s deeply ingrained in the culture of BMWC. To us, it means more than making sure our workers don’t get injured — it means having a culture of caring that takes into account the well-being of our employees, subcontractors, clients, families and communities, so everyone leaves the job as healthy as when they arrived. Ensuring the safety of our employees requires detailed planning and consistency. We see to it that all of our employees have the right tools and training to do their jobs, and we have a system of checks and balances to uphold our standard of safety. This includes having an executive safety sponsor on every project, so management can always be openly approached with any questions or concerns regarding safety. 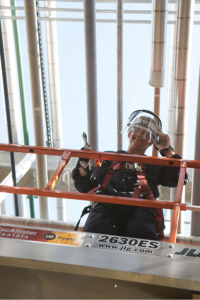 We don’t hire one-off safety personnel like other construction companies — we have more than 20 full-time safety professionals who understand our culture of safety and provide 24/7 resources for any employee with a question or concern. These safety experts complement the personal safety accountability that we instill in our employees from the first day they begin work at BMWC and throughout their careers. We believe that 100% of accidents are preventable, and our results in achieving the highest safety standards speak for themselves. Our accident rates have continued to decline along with the severity of incidents. Others have taken notice: BMWC has received safety awards at the local, regional, national and global levels. Also, BMWC is now OSHA VPP certified at any jobsite throughout the state of Indiana. BMWC was the first contractor in Indiana to receive the original VPP Certified status in 2004. It was for a single, fixed facility location. BMWC is now one of the first construction companies in Indiana to achieve OSHA’s Voluntary Protection Program Mobile Workforce Star Status. Safety also means adhering to environmental safety standards. Since we work with hazardous materials that could potentially be damaging to neighboring communities, we take our commitment to meeting and exceeding rules and regulations very seriously. You can be sure that we won’t just go the extra mile to ensure our own safety — we also do whatever it takes to ensure the safety of our clients and the communities we serve.